Eric Riehm, Von Barlow, and Lawrence Buckner Yes, they pinned more money on the birthday girl! Ok Sun Burks, "Thank you all for coming. The guest of honor should be arriving shortly." "SURPRISE!" "Oh, My God!" "Okay, let's get ready, I just saw her arrive..." "Where'd she go? Corey, where are you taking her?" "Oh, My God!" The Grimes children. I've known them since they were zygotes! PAGE A-6THE STAR OCTOBER 27, 2012 Once you know, theres only one place to go.Perhaps youve been running all over town to save a little bit here and a little bit there. When all the time, you could save just as much at Publix, and enjoy the shopping experience, too. So relaxweve got you covered. Go to publix.com/save right now to make plans to save this week. OCTOBER 27, 2012 THESTAR PAGEB-1 Jacksonville Southern Womens Show Brings Out Three Days Of Sisterhood, Showcases, Style and Sensational Good Times Danielle Knox from The Balancing Act on Lifetime and Teresa Giudice from the Real Housewives of New Jersey were on hand for the 25th Annual Southern Womens Show in Jacksonville. The event, held at the Prime Osborn Convention Center celebrated its 25th year October 18th to 21st. Hundreds of exhibitions were on hand including Milos Tea Company, Publix Aprons Cooking School and a steamy striptease and modeling show by the local firemen thrilled the predominantly female audience. The highly anticipated fashion shows, cooking demonstrations and booths with crafts, books, jewelry, beauty, health, foods and more didnt disappoint. Attendees were also anxious for the mother daughter look-alike contest also bought out scores of competitors in the family friendly weekend. Staff from Florida and Georgia Star, including publisher Clara McLaughlin, took time to meet and greet readers at our booth. PHOTOS: Angela Favors-Morrell, Florida/Georgia Star FOURGENERATIONS:Mary McKinney, 87; Janice Thomas 63; Geanene Brown, 45; and Lanea Brown, 22 enjoy a family affair. L to R: Mrs. Gundy, Gwen Davis,Dean, JGMBC, Pastor R.L. Gundy, Florida State President, SCLC and Clara McLaughlin. Mother and daughter look-a-likes. PAGE B-2THE STAROCTOBER 27, 2012Prep Rap Prep Rap OCTOBER 27, 2012PREP RAP PR 3 H a p p y H a l l o w e e n Across 3. A funny costume. 5. What do you wear on your face? 6. _____-or-treat! 8. Scary thing that says boo. 10. Roasted pumpkin _____. 11. Small black animal that can fly. 12. Kids get lots of this. Down 1. A monster with many bandages. 2. ____-o-lantern 3. What do you wear on Halloween? 4. A woman with a pointy black hat. 7. A witchs pet. 9. spookyhtt p ://bo gg lesworldesl.com Name that monster:1. A __________ is a monster that changes shape during the full moon. 2. A __________ is a monster that is made from bones.Color the pictures below PR 1 Team Success Celebrates Rise From F School to A School Bradenton, Florida Charter School serves as a model for Florida and the Nation In keeping with its mission to celebrate academics like America celebrates sports, Team Success charter school held an academic pep rally recently to commemorate its rise from an F school to an A school in just two years. Serving about 300 students from kindergarten through 8th grade, Team Success was the only Title 1 school in Manatee County to earn an A grade from the Florida Department of Education. We are making history right here in Bradenton, Florida, said Fredrick Spence, CEO and principal of the charter school, speaking to the students, families and guests assembled in the packed school cafeteria. We did it. Spence credited the dedication of the teachers and staff, who stood on stage wearing Superman T-shirts, a reference to the Waiting for Superman documentary on the failures of the American public education system. He also recognized the hard work of the students, who were awarded $13,800 in cash for their performance on the Florida Comprehensive Assessment Test (FCAT) for the 2011-2012 academic year. Students received $50 to $150 for each passing score in Math, Science, Reading and Writing. The cash awards were presented by Team Success Board President Dr. Doug Colkitt, a radiation oncologist, who donated the $13,800. Its the best money Ive spent all year, he told the assembly. Every student received a backpack monogrammed with an A and stuffed with school supplies and goodies donated by Alltrust Insurance. The celebration also launched The Year of the Repeat theme, rallying teachers, staff and students to gear up for another A grade for the 2012-2013 academic year. Professional basketball player Udonis Johneal Haslem of the Miami Heat congratulated and encouraged the students in a pre-recorded video played at the celebration. Miami Heat, winner of the 2012 National Basketball Association championship, is also in its repeat year. Team Success charter school was opened in 1997 by the Manatee County Sheriffs Office as the Police Athletic League Academy to serve students in at-risk neighborhoods threatened by gangs, drugs, violence and poverty. It is now independent of the Sheriffs Office. After years of dismal student test scores and consistent F ratings for the school, the board of directors was faced with shutting the school down or turning it around. Enter Spence, a former Sarasota, Florida school administrator, who took charge of the charter school in 2007. Spence, who came up the ranks from high school physical education teacher and coach, had played football at Howard University in Washington, D.C., and earned his masters degree in Education Administration from Northeastern University in Chicago. He uses sports motivational techniques to inspire teachers and students. Team Success demonstrates that contrary to popular opinion, Title 1 students can be successful, said Spence after the ceremony. They should have the same expectations as any other population of students, he said. Title 1 schools are schools where at least 40 percent of the children are from low-income families and are eligible to receive federal funds for additional resources. Cash awards for student performance may be controversial, but they are only part of an overall program geared toward motivating students to want to learn and achieve. While money is the carrot, the sense of pride and accomplishment is the reward, explained school director Aimiee Fleming. It is our primary goal for our students to achieve at their highest level, and in order for them to be able to do so, we foster their intrinsic motivation, she said. Students are tested throughout the year to make sure they are on track, including state and district mandated assessments, as well as three of Team Success schools own assessments. Team Success also makes sure the students needs are met so that they are ready to learn. Recently, the school partnered with the Elks Club to provide food backpacks for children to take home during the weekend. The school also partnered with Prevent Blindness Florida, a nonprofit organization, to pay for vision screenings and glasses. From school supplies to winter coats, the school finds a way to make sure no student is distracted from learning.Website: www.teamsuccessschools.com Students Jattorious Galloway and Jasmine McDaniel Science teacher Monica Arrington, a Tampa Bay Buccaneers cheerleader, with students Sarahi Padilla and Cory Gibbs School Director Aimiee Fleming and Principal Fred Spence congratulate student Fritzi Santiago, who received a perfect score in third grade math on the FCAT test, the first perfect score in the schools history. PAGE B-4 THESTAR OCTOBER 27, 2012 OPINION OWNER/PUBLISHER CLARA McLAUGHLIN LEATH MANAGEMENT LONZIE LEATH, RINETTA M. FEFIE SALES & MARKETING DAN EVANS OFFICE/ACCOUNTS MANAGER SHIQUITA WILSON LAYOUT EDITOR MAY E. FORD CRIME &JUSTICE KEVIN KIM CARIBBEAN NEWS/SPECIAL LAYOUT ARTHIA NIXONInvestigative Reporter : Lonzie Leath Reporters/Photographers : Marsha Phelts, Laurence Greene, F. M. Powell, III, Michael Phelts, Richard McLaughlin, Andrea F. K. Ortiz, Angela Morrell, and Cheryl Williams Columnists : Ulysses Watkins, Jr., M.D., Ester Davis, Lucius Gantt, Ask Deanna, Cynthia Ferrell, Delores Mainor Woods, Farris Long Distribution and Sales : Abeye Ayele, Cassie Williams, Shiquita Wilson, David Scott TEL: (904) 766-8834 FAX: (904) 765-1673 info@thefloridastar.com (912) 264-3137 Georgia Serving St. Johns, Clay, Duval, Nassau, Alachua, Flagler, Marion, McIntosh, Camden And Glynn CountyTheFloridaStar.comThe Florida and Georgia Star Newspapers are independent newspapers published weekly in Jacksonville, Florida SUBSCRIPTIONRATES One Year-$40.00 Half Year-$22.00Send check or money order or call with VISA, AmEx, MC, DISCOVER and subscription amount to: The Florida Star, The Georgia Star P.O. Box 40629 Jacksonville, Florida 32203 The Florida Star will not be responsible for the return of any solicited or unsolicited manuscripts or photos. Opinions expressed by columnists in this newspaper do not necessarily represent the policy of this paper.MEMBERSHIPS: Florida Press Association National Newspaper Association National Newspaper Publishers Association Amalgamated Publisher, Inc. Jacksonville Chamber of Commerce First Coast African American Chamber of Commerce THEFLORIDA STAR THE GEORGIA STAR DESIGN AND WEB SITE PARTNER ALLEN PROCTOR AROUND THE TOWN FRANCES BRADLEY, VOLUME BURKES SPECIAL SECTIONS TIA AYELE SPORTS EDITOR MIKE BONTS COLUMNS YOLANDA KNUCKLE GEORGIA MARKETING ANGELA FAVORS MORRELL DISTRIBUTION DAVID SCOTT National Newspaper Publishers Association Why Wait?LET THE POST OFFICE DELIVER THE FLORIDA or GEORGIA STAR TO YOUI want a One Year Subscription to The Florida or Georgia Star!Please donate 10% of my paid Subscription to the non-profit organization listed below. Please send my Paid Subscription to: Name ___________________________________________________________ Address _________________________________________________________ City ____________________________________________________________ State ________________ Zip Code _______________ Name of Organization for Donation: ______________________________________________ ______________________________________________ A TRADITION OF EXCELLENCE ()6 Months $22.00 ()One Year $40.00 ()2 Years $70.00 SEND TO: The Florida/Georgia StarPost Office Box 40629 Jacksonville, FL32203-40629 Ofc: 904-766-8834 www.TheFloridaStar.com Cash, Money Order, Check, PayPal, and/or Credit Card Accepted Founded In April 1951 By Eric O. Simpson First African American Inducted Into The Florida Press Hall Of Fame Be Sure, Your Sin Will Find You OutDr. James L. SnyderIt happened to me again this past week for the umpteenth time. The last time it happened, I promised myself it would never happen again, as long as I lived. So much for my promises, or maybe I died. I found myself stranded at the neighborhood grocery store. I meant to put gas in my car, honest I did. Somehow, it slipped my mind. I do not mind things slipping my mind if they are not important, and if it does not involve the Gracious Mistress of the Parsonage. Unfortunately for me, this did. I dont mind lectures from my Beloved, if I could sometimes pick the topic. Topics like religion and politics would be a nice change. Her topic, which she never tires of, is my forgetfulness. At least I cant remember any other topic at the moment. My car was definitely out of gas and I was going nowhere in it. My only recourse was to walk across the street to the store, and call my wife to come and bail me out of trouble. Every husband knows how difficult this is because we have to do it so often. I went to the phone booth in the store and made the call. Then I went and took a seat to wait for her arrival. As I was waiting, I noticed an elderly gentleman come into the store. I call him a gentleman, but these days, who knows? This man walked into the store as if he was concerned about being followed. Every few steps he threw a glance over his shoulder as if someone was stalking him. Since I did not have anything to do for the next 20 minutes, I settled back to watch. When he got into the store, he cautiously walked around the store as if casing it. So many stores are being robbed; I didnt know but this man was planning to pull off a heist. My interest piqued, which kept my mind off the trouble I was in with my wife when she arrived to pick me up. When a person is in trouble, it is always a good thing to try to take ones mind off said trouble, and on someone who might be in more trouble than you are at the moment. At least, thats what I told myself at the time. When a person is facing trouble, he will say anything to himself to calm those jagged nerves. The man walked around the store several times, always glancing over his shoulder as if he expected something to happen. As far as I could tell, he was an ordinary man with no special features. He walked with a slow shuffle, but thats to be expected when a mans body ages. I saw him stand over against a corner for several minutes while he intently watched the front door. A little spooked by this time, I did not know if I should alert the manager or call the police. I envisioned the headlines in the newspapers the next day: Local pastor dies a heros death in the crossfire. I sure would like to be a hero, but only in my own mind. This hero business can be a little dangerous, so I was in a quandary. In scanning the gentleman as best I could, I knew he could not have a large weapon on his person. The loose fitting shirt revealed no bomb strapped to his chest, which was a little comforting. Then the gentleman began to move and I froze. My life flashed before me in an instant which bored me almost to death. I never want to experience anything like that ever again. My focus once again went to the gentleman in motion. What was he going to do? Gradually he eased up to the bakery department. I almost stood, but at my height, I would be an easy target. Its hard for anyone to miss a barn door, especially one with a flashy smile. I braced myself for what would happen next. Then it happened. The elderly gentleman, with one last glance over his shoulder, bought a chocolate clair. I was confused relieved but confused. What was all the secrecy about? About this time, I saw him slither toward the bench where I was sitting. Without looking at me, the man sank into the corner as though hiding from someone. He sat there for a few minutes and then he opened his bag with the clair. Just as he took his first bite, someone recognized him, came up and said, Henry, is that a chocolate clair youre eating? He glanced at me and gave me one of those sick smiles that every husband recognizes. No matter how hard you try to keep something (like clairs) from your wife, it is impossible. There is a spiritual lesson here. No matter how hard you try to hide your sin, somewhere, somehow, when you least expect it, someone will see you. An Old Testament scripture lays down an important principle in this regard. But if ye will not do so, behold, ye have sinned against the Lord: and be sure your sin will find you out. (Numbers 32:23 KJV.) David, the Psalmist, knew this and wrote, Search me, O God, and know my heart: try me, and know my thoughts: And see if there be any wicked way in me, and lead me in the way everlasting. (Psalm 139:23-24 KJV.) Live your life as though someone was watching you, because, Someone is watching you. Dr. James L. Snyder is pastor of the Family of God Fellowship, PO Box 831313, Ocala, FL 34483. He lives with his wife, Martha, in Silver Springs Shores. Call him at 1-866-552-2543 or e-mail jamessnyder2@att.net. His web site is www.jamessnyderministries.com. Real Estate & Personal Property Cliffside Mansion & Cottages, 216+/Acre Country Estates, Offered in 17 Tracts in Carroll County and Galax, VA. Long frontage on New River Trail and Chestnut Creek. Guaranteed to Sell Over $699,000. November 8, 10 am Personal Property; November 9, 10 am Personal Property, Real Estate sells at NOON. Sale held On-Site-Tract 7, 506 Cliffview Road, Galax, VA 24333. 5% Buyers Premium on Real Estate, 10% Buyer's Premium on Personal Property. For more information, go to woltz.com or call Woltz & Associates, Inc, Brokers & Auctioneers, (VA# 321) Roanoke, VA, (800)551-3588. Wed, Oct 24, 2012 People surveyed in 21 countries over whelmingly favor President Obama over Mitt Romney. Whats behind that landslide? President Obama and Mitt Romney are locked in an incredibly tight race at home, but overseas, the vote isnt even close. A BBC World Service opinion poll found that residents of 21 foreign countries overwhelmingly support Obama, with an average of 50 percent hoping that he wins a second term and only 9 percent favoring Romney. France is Obamas biggest booster  72 percent of respondents support him. The only country where Romney enjoyed greater support than Obama? Pakistan. So why are foreigners in the bag for Obama? Here, three theories: 1. Obamas foreign policy works Overseas, the president has an undeniably strong record, says Jeffrey Simpson at Canadas Globe and Mail Obama has shown hes capable of mixing muscularity with restraint, extricating the U.S. from wars in Iraq and Afghanistan, avoiding direct intervention in Syria, and resisting the push to recklessly attack Iran  all while relentlessly going after terrorists and playing a limited but key role in forcing regime change in Libya. Meanwhile, the world sees Romney displaying the hubris of the powerful and the ignorance of the uninformed, thumping his chest and scaring folks overseas. Forget foreign policy. This election is about the economy. 2. The world is associating Romney with Bush In many ways, this isnt really a reflection on Romney, says Max Fisher at The Washington Post In Pakistan, for example, people arent embracing Romney so much as protesting Obamas drone program in areas near the Afghan border. And more broadly, Romneys overseas poll numbers are consistent with [Sen. John] McCains in 2008, suggesting the possibility that many foreign publics associate Republicans with George W. Bush, whose administration was deeply unpopular abroad. 3. Soaking the rich is popular overseas The fact that France is more pro-Obama than anyone else says it all, says Matthew Balan at News Busters France is a leftist nanny state, and socialist President Francois Hollandeis trying to slap a 75 percent marginal income tax on people earning more than 1 million euros a year, a move the Heritage Foundations Nile Gardiner called economic suicide. Such proposals line up nicely with the presidents platform. No wonder he polls so well there. PAGE A-4 THE STAR OCTOBER 27, 2012Talk of the Town! Talk of the Town! Frances Bradley Columnist frances@thefloridastar.comVolume Burks, Photographer E kaabo (eh-kah-bow). Welcome. Happy Birthday To Me! Happy Birthday to Me! Happy Birthday!This time last year, I did not let you forget it was my birthday. I was quieter about it this year (chalk it up to maturity). Nevertheless, it was a weekend to remember. In fact, I cant wait to share the wonderful adventures Ive had this year. The Florida Black Expo, which is always the same weekend as my birthday, is a thinly disguised birthday bash for me (FBE, Florida Black Expo, Frances Bradley Extravaganza)! For eleven years, Darrin Thomas, President of Thomas Media Group, publishers of the Black Pages and sponsors of Florida Black Expo, his executive team from the Columbia, S.C. headquarters Jeannie Jackson, Vice President of Marketing, Tre Tailor, Director of Media Relations, Cheryl Brown, Comptroller, Sir Armin Sheffield, Graphics Designer, Natasha Jenkins, Expo Coordinator, and Thelma Davidson, Sr. Account Executive (Jacksonville) the local team headed by Volume Burks, and including Ok Sun Burks, Brenda Frinks, and the events sponsors, among them Florida Blue, City of Jacksonville, Wells Fargo, BB&T, have joined forces to present an exciting, multi-day event in Jacksonville. Thank you Darrin and Jeannie for my birthday gift, R&B crooner, Eric Benet, who is also a Libran! As exciting as all that was, the best was yet to come. I was reduced to blubber and tears the next day when friends and family surprised me with a party at the Island Tropics Restaurant Banquet Room (my favorite Jamaican diner). I was completely, thoroughly, unequivocally, without a doubt SURPRISED when, Corey and Franklin Wilborn, Jeanine Downing, and Sydney Nurse (owner of the restaurant) ushered me into the restaurants banquet room under the guise of touring the facilities for a debate watch event! It was an intimate affair put together by my BFFs, Ok Sun and Volume Burks, cousin Barbara Breaker, and a host of friends who managed to surreptitiously plan something for a very inquisitive person (some call it nosey, but I know I would have made a great detective). Thank you old friends who could not be there ( Reneeand Frank Lee, Patricia Tompkins), kindergarten friend, jazz flutist Linda Witsell, who, on the spot, graciously agreed to play a jazz tune, Night in Tunisia (I knew shed have her axe), new friends (ye of first name fame) Chevara (Orrin) and Marlon (Hubbard), good friend Velda Scott, god sister and god brother, Janice and Tariq MunginBey, goddaughter Titilayo Kendrick, Delorise Kendrick and her babies, DeAndre and Deanna, Brenda Onfroy, Lauretta Mims, cousin James Burroughs, Linda and Dennis Stewart, George and Hazel Gillis, Carl Gamble, Scott and Maggie Grimes and their children, Marsha and Michael Phelts (love the iron American Beach sign), Marilyn Williams, Ken Hamilton, my Chloe-oe and Clint Groomes, Mary Jones, Hyacinth Jackson, Martha Aduibaje Davis, Vimilakshi Archer, Herb Wilson, Jacoby Pittman-Peele, Khamil Ojoyo (who ducked out before I could get my swing on), Walter Guice massage therapist extraordinaire, (who let me get my swing on as we sang Luthers Bad Boy/Having a Party), and everyone who made this special new year unforgettable they pinned money to my clothes, making me a walking money tree. Food, wine, money, friends, family who could ask for anything more? Anyone who knows me knows that I love a good party. So, we ended the night at Casbah Restaurant on St. Johns Avenue with the incredible jazz sounds of 3 rd Bass Eric Riehm, Von Barlow, and Lawrence Buckner. Yes, they pinned more money on the birthday girl! Ok Sun Burks, "Thank you all for coming. The guest of honor should be arriving shortly." "SURPRISE!" "Oh, My God!" "Okay, let's get ready, I just saw her arrive..." "Where'd she go? Corey, where are you taking her?" "Oh, My God!" The Grimes children. I've known them since they were zygotes! PAGE A-6 THE STAR OCTOBER 27, 2012 Once you know, theres only one place to go.Perhaps youve been running all over town to save a little bit here and a little bit there. When all the time, you could save just as much at Publix, and enjoy the shopping experience, too. So relaxweve got you covered. Go to publix.com/save right now to make plans to save this week. PAGE B-2 THE STAR OCTOBER 27, 2012Prep Rap Prep Rap OCTOBER 27, 2012 PREP RAP PR 3 Happy Halloween! Across 3. A funny costume. 5. What do you wear on your face? 6. _____-or-treat! 8. Scary thing that says boo. 10. Roasted pumpkin _____. 11. Small black animal that can fly. 12. Kids get lots of this. Down 1. A monster with many bandages. 2. ____-o-lantern 3. What do you wear on Halloween? 4. A woman with a pointy black hat. 7. A witchs pet. 9. spookyhtt p ://bo gg lesworldesl.com Name that monster:1. A __________ is a monster that changes shape during the full moon. 2. A __________ is a monster that is made from bones.Color the pictures below PR 1 Team Success Celebrates Rise From F School to A School Bradenton, Florida Charter School serves as a model for Florida and the Nation In keeping with its mission to celebrate academics like America celebrates sports, Team Success charter school held an academic pep rally recently to commemorate its rise from an F school to an A school in just two years. Serving about 300 students from kindergarten through 8th grade, Team Success was the only Title 1 school in Manatee County to earn an A grade from the Florida Department of Education. We are making history right here in Bradenton, Florida, said Fredrick Spence, CEO and principal of the charter school, speaking to the students, families and guests assembled in the packed school cafeteria. We did it. Spence credited the dedication of the teachers and staff, who stood on stage wearing Superman T-shirts, a reference to the Waiting for Superman documentary on the failures of the American public education system. He also recognized the hard work of the students, who were awarded $13,800 in cash for their performance on the Florida Comprehensive Assessment Test (FCAT) for the 2011-2012 academic year. Students received $50 to $150 for each passing score in Math, Science, Reading and Writing. The cash awards were presented by Team Success Board President Dr. Doug Colkitt, a radiation oncologist, who donated the $13,800. Its the best money Ive spent all year, he told the assembly. Every student received a backpack monogrammed with an A and stuffed with school supplies and goodies donated by Alltrust Insurance. The celebration also launched The Year of the Repeat theme, rallying teachers, staff and students to gear up for another A grade for the 2012-2013 academic year. Professional basketball player Udonis Johneal Haslem of the Miami Heat congratulated and encouraged the students in a pre-recorded video played at the celebration. Miami Heat, winner of the 2012 National Basketball Association championship, is also in its repeat year. Team Success charter school was opened in 1997 by the Manatee County Sheriffs Office as the Police Athletic League Academy to serve students in at-risk neighborhoods threatened by gangs, drugs, violence and poverty. It is now independent of the Sheriffs Office. After years of dismal student test scores and consistent F ratings for the school, the board of directors was faced with shutting the school down or turning it around. Enter Spence, a former Sarasota, Florida school administrator, who took charge of the charter school in 2007. Spence, who came up the ranks from high school physical education teacher and coach, had played football at Howard University in Washington, D.C., and earned his masters degree in Education Administration from Northeastern University in Chicago. He uses sports motivational techniques to inspire teachers and students. Team Success demonstrates that contrary to popular opinion, Title 1 students can be successful, said Spence after the ceremony. They should have the same expectations as any other population of students, he said. Title 1 schools are schools where at least 40 percent of the children are from low-income families and are eligible to receive federal funds for additional resources. Cash awards for student performance may be controversial, but they are only part of an overall program geared toward motivating students to want to learn and achieve. While money is the carrot, the sense of pride and accomplishment is the reward, explained school director Aimiee Fleming. It is our primary goal for our students to achieve at their highest level, and in order for them to be able to do so, we foster their intrinsic motivation, she said. Students are tested throughout the year to make sure they are on track, including state and district mandated assessments, as well as three of Team Success schools own assessments. Team Success also makes sure the students needs are met so that they are ready to learn. Recently, the school partnered with the Elks Club to provide food backpacks for children to take home during the weekend. The school also partnered with Prevent Blindness Florida, a nonprofit organization, to pay for vision screenings and glasses. From school supplies to winter coats, the school finds a way to make sure no student is distracted from learning.Website: www.teamsuccessschools.com Students Jattorious Galloway and Jasmine McDaniel Science teacher Monica Arrington, a Tampa Bay Buccaneers cheerleader, with students Sarahi Padilla and Cory Gibbs School Director Aimiee Fleming and Principal Fred Spence congratulate student Fritzi Santiago, who received a perfect score in third grade math on the FCAT test, the first perfect score in the schools history. PAGE B-4 THESTAR OCTOBER 27, 2012 OPINION OWNER/PUBLISHER CLARA McLAUGHLIN LEATH MANAGEMENT LONZIE LEATH, RINETTA M. FEFIE SALES & MARKETING DAN EVANS OFFICE/ACCOUNTS MANAGER SHIQUITA WILSON LAYOUT EDITOR MAY E. FORD CRIME &JUSTICE KEVIN KIM CARIBBEAN NEWS/SPECIAL LAYOUT ARTHIA NIXONInvestigative Reporter : Lonzie Leath Reporters/Photographers : Marsha Phelts, Laurence Greene, F. M. Powell, III, Michael Phelts, Richard McLaughlin, Andrea F. K. Ortiz, Angela Morrell, and Cheryl Williams Columnists : Ulysses Watkins, Jr., M.D., Ester Davis, Lucius Gantt, Ask Deanna, Cynthia Ferrell, Delores Mainor Woods, Farris Long Distribution and Sales : Abeye Ayele, Cassie Williams, Shiquita Wilson, David Scott TEL: (904) 766-8834 FAX: (904) 765-1673 info@thefloridastar.com (912) 264-3137 Georgia Serving St. Johns, Clay, Duval, Nassau, Alachua, Flagler, Marion, McIntosh, Camden And Glynn CountyTheFloridaStar.comThe Florida and Georgia Star Newspapers are independent newspapers published weekly in Jacksonville, Florida SUBSCRIPTIONRATES One Year-$40.00 Half Year-$22.00Send check or money order or call with VISA, AmEx, MC, DISCOVER and subscription amount to: The Florida Star, The Georgia Star P.O. Box 40629 Jacksonville, Florida 32203 The Florida Star will not be responsible for the return of any solicited or unsolicited manuscripts or photos. Opinions expressed by columnists in this newspaper do not necessarily represent the policy of this paper.MEMBERSHIPS: Florida Press Association National Newspaper Association National Newspaper Publishers Association Amalgamated Publisher, Inc. Jacksonville Chamber of Commerce First Coast African American Chamber of Commerce THEFLORIDA STAR THE GEORGIA STAR DESIGN AND WEB SITE PARTNER ALLEN PROCTOR AROUND THE TOWN FRANCES BRADLEY, VOLUME BURKES SPECIAL SECTIONS TIA AYELE SPORTS EDITOR MIKE BONTS COLUMNS YOLANDA KNUCKLE GEORGIA MARKETING ANGELA FAVORS MORRELL DISTRIBUTION DAVID SCOTT National Newspaper Publishers Association Why Wait?LET THE POST OFFICE DELIVER THE FLORIDA or GEORGIA STAR TO YOUI want a One Year Subscription to The Florida or Georgia Star!Please donate 10% of my paid Subscription to the non-profit organization listed below. Please send my Paid Subscription to: Name ___________________________________________________________ Address _________________________________________________________ City ____________________________________________________________ State ________________ Zip Code _______________ Name of Organization for Donation: ______________________________________________ _______________________________________________ A TRADITION OF EXCELLENCE () Months $22.00 ()One Year $40.00 () Years $70.00 SEND TO: The Florida/Georgia StarPost Office Box 40629 Jacksonville, FL-40629 Ofc: 904-766-8834 www.TheFloridaStar.com Cash, Money Order, Check, PayPal, and/or Credit Card Accepted Founded In April 1951 By Eric O. Simpson First African American Inducted Into The Florida Press Hall Of Fame Be Sure, Your Sin Will Find You OutDr. James L. SnyderIt happened to me again this past week for the umpteenth time. The last time it happened, I promised myself it would never happen again, as long as I lived. So much for my promises, or maybe I died. I found myself stranded at the neighborhood grocery store. I meant to put gas in my car, honest I did. Somehow, it slipped my mind. I do not mind things slipping my mind if they are not important, and if it does not involve the Gracious Mistress of the Parsonage. Unfortunately for me, this did. I dont mind lectures from my Beloved, if I could sometimes pick the topic. Topics like religion and politics would be a nice change. Her topic, which she never tires of, is my forgetfulness. At least I cant remember any other topic at the moment. My car was definitely out of gas and I was going nowhere in it. My only recourse was to walk across the street to the store, and call my wife to come and bail me out of trouble. Every husband knows how difficult this is because we have to do it so often. I went to the phone booth in the store and made the call. Then I went and took a seat to wait for her arrival. As I was waiting, I noticed an elderly gentleman come into the store. I call him a gentleman, but these days, who knows? This man walked into the store as if he was concerned about being followed. Every few steps he threw a glance over his shoulder as if someone was stalking him. Since I did not have anything to do for the next 20 minutes, I settled back to watch. When he got into the store, he cautiously walked around the store as if casing it. So many stores are being robbed; I didnt know but this man was planning to pull off a heist. My interest piqued, which kept my mind off the trouble I was in with my wife when she arrived to pick me up. When a person is in trouble, it is always a good thing to try to take ones mind off said trouble, and on someone who might be in more trouble than you are at the moment. At least, thats what I told myself at the time. When a person is facing trouble, he will say anything to himself to calm those jagged nerves. The man walked around the store several times, always glancing over his shoulder as if he expected something to happen. As far as I could tell, he was an ordinary man with no special features. He walked with a slow shuffle, but thats to be expected when a mans body ages. I saw him stand over against a corner for several minutes while he intently watched the front door. A little spooked by this time, I did not know if I should alert the manager or call the police. 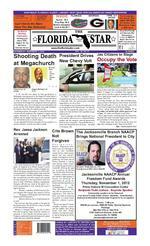 I envisioned the headlines in the newspapers the next day: Local pastor dies a heros death in the crossfire. I sure would like to be a hero, but only in my own mind. This hero business can be a little dangerous, so I was in a quandary. In scanning the gentleman as best I could, I knew he could not have a large weapon on his person. The loose fitting shirt revealed no bomb strapped to his chest, which was a little comforting. Then the gentleman began to move and I froze. My life flashed before me in an instant which bored me almost to death. I never want to experience anything like that ever again. My focus once again went to the gentleman in motion. What was he going to do? Gradually he eased up to the bakery department. I almost stood, but at my height, I would be an easy target. Its hard for anyone to miss a barn door, especially one with a flashy smile. I braced myself for what would happen next. Then it happened. The elderly gentleman, with one last glance over his shoulder, bought a chocolate clair. I was confused relieved but confused. What was all the secrecy about? About this time, I saw him slither toward the bench where I was sitting. Without looking at me, the man sank into the corner as though hiding from someone. He sat there for a few minutes and then he opened his bag with the clair. Just as he took his first bite, someone recognized him, came up and said, Henry, is that a chocolate clair youre eating? He glanced at me and gave me one of those sick smiles that every husband recognizes. No matter how hard you try to keep something (like clairs) from your wife, it is impossible. There is a spiritual lesson here. No matter how hard you try to hide your sin, somewhere, somehow, when you least expect it, someone will see you. An Old Testament scripture lays down an important principle in this regard. But if ye will not do so, behold, ye have sinned against the Lord: and be sure your sin will find you out. (Numbers 32:23 KJV.) David, the Psalmist, knew this and wrote, Search me, O God, and know my heart: try me, and know my thoughts: And see if there be any wicked way in me, and lead me in the way everlasting. (Psalm 139:23-24 KJV.) Live your life as though someone was watching you, because, Someone is watching you. Dr. James L. Snyder is pastor of the Family of God Fellowship, PO Box 831313, Ocala, FL 34483. He lives with his wife, Martha, in Silver Springs Shores. Call him at 1-866-552-2543 or e-mail jamessnyder2@att.net. His web site is www.jamessnyderministries.com. PAGE B-5 THESTAR OCTOBER 27, 2012 CLASSIFIEDS Place Your Ad We also accept Cash and Money Orders Call Keke 904-766-8834To Advertise Order by Tuesday @ 4:00 p.m. Artwork in by Wednesday @ 4:00 p.m. THOMAS PLUMBING REPAIRS Low Rates. (904) 764-9852 HANDYMAN Minor Home Repairs, Painting interior/exterior, Pressure Washing, Exp. & Reasonable Rates Call: 904.768.7671 LIGHTEN YOUR LOAD withW & W Moving & Delivery Service An Experienced & Proud Moving Service Same Day Delivery to Any Local Point Low Hourly or Flat Rate *FREE ESTIMATES CALL TO SCHEDULE YOUR APPOINTMENT! (904) 563-5656 SERVICES EPIPHANY MANOR 62+ Income eligible Studios & One Bedrooms386-767-2556TTY: 1-800-955-8771 Drivers HIRING EXPERIENCED/INEXPERIENCED TANKER DRIVERS! Earn up to $.51/mile! New Fleet Volvo Tractors! 1 Year OTR Exp. Req. Tanker Training Available. Call Today! (877)882-6537 www.OakleyTransport.com Apply Now, 13 Drivers. Top 5% Pay & Benefits. Need CDL Class A Driving Exp (877)258-8782 www.drive4melton.com Experienced OTR Flatbed Drivers earn 50 up to 55 cpm loaded. $1000 sign on to qualified drivers. Home most weekends. Call: (843)266-3731 / www.bulldoghi way.com EOE EMPLOYMENT MISCELLANEOUS AIRLINES ARE HIRING Train for hands on Aviation Maintenance Career. FAA approved program. Financial aid if qualified Housing available CALL Aviation Institute of Maintenance (866)314-3769 NURSING CAREERS BEGIN HERE GET TRAINED IN MONTHS, NOT YEARS. FINANCIAL AID IF QUALIFIED. HOUSING AVAILABLE. JOB PLACEMENT ASSISTANCE. CALL CENTURA INSTITUTE (877) 206-6559 AIRLINE CAREERS Become an Aviation Maintenance Tech. FAA approved program. Financial aid if qualified Housing available. Job placement assistance. CALL Aviation Institute of Maintenance (866)314-3769 MEDICAL CAREERS begin here -Train ONLINE for Allied Health and Medical Management. Job placement assistance. Computer available. Financial Aid if qualified. SCHEV authorized. Call 888-203-3179 www.CenturaOnline.com HELP WANTED Subscribe toThe Florida Star The Georgia StarNewspapersCall (904) 766-8834www.TheFloridaStar.com Affordable Apartment Homes3505 Corby Street, Jacksonville, FL 32205 (904) 381-4817 1-800-955-8771/711 TTY *Income & Age Limits Apply FOR RENT Change Your Life. Your Future.You have the power to change your future. And you can do it right here at:Florida State College at Jacksonville .To learn about employment opportunities that are available, please visit our website at Jobs.FSCJ.edu The Towers of JacksonvilleAffordable Housing for Seniors 1400 LeBaron Avenue Jacksonville. FL. 32207 Telephone (904)398-3406 Fax (904) 398-8080 E-mail:leasing@ttoj.net Visit our web site at www.thetowersofjacksonville.com *TDD/TTY Florida Relay 711* Newspaper Boy from 1921 PIPEFITTERS EARN WHILE YOU LEARN FLORIDA AUTOMATIC SPRINKLER TRAINING, NE FL CH., GNJ APPRENTICESHIP PROGRAM ACCEPTS APPLICATIONS YEAR ROUND FROM QUALIFIED APPLICANT'S FOR 4 YEAR STATE CERT. PROG. JOURNEYMAN CERTIFICATION UPON COMPLETION 904-268-4831 WWW.FASTAPP.US BUSINESS OPPORTUNITIES Drivers/ Class A Flatbed. GET HOME WEEKENDS! Up to 39/mi, Late model equipment & Big Miles! 1yr OTR Flatbed experience, (800)572-5489 x227, SunBelt Transport TIRED OF LIVING PAYCHECK TO PAYCHECK? There's great earning potential as a Professional Truck Driver! The average Professional Truck Driver earns over $700/wk*! 16-Day CDL Training @ NFCC/Roadmaster! Approved for Veterans Training. CALL TODAY! (866)467-0060 *DOL/BLS 2012 Drivers 100% Owner Operator Co. Pay increase / Home weekly, Regional & Dedicated, Class A C.D.L. 1 yr. exp. In last 3 Call (800)695-9643 or www.driveforwatkins.com OTR DRIVERS WANTED EMPLOYMENT OPPORTUNITIES Value Stream Leader 81995 Sr. Accountant 82603 Sr. Quality Engineer 81851 Manager, Project Management 82413 Please apply online at http://jobs.medtronic.com using the requisition number listed. Medtronic is an Equal Opportunity /Affirmative Action employer committed to cultural diversity in the workforce HELP WANTED (continued) RIVERSIDE PARK APARTMENTSNow Accepting Applications for One Bedroom Apartments for the Ederly and Younger than 62 disabledRent based on income Apply: 750 Oak Street Jacksonville, FL 32204(904) 356-9884 TTY: 800-955-8771 FINANCIAL SERVICES SCHOOLS & INSTRUCTION MEDICAL BILLING TRAINING! Train for Medical Billing Careers at SCTrain.edu No Experience Needed! Job placement assistance after training! HS/GED/PC Needed (888)8724677 CASH NOW!! RECEIVING PAYMENTS from Mortgage Notes, Structured Settlements, Contest annuity or Cell Tower Lease? SELL PAYMENTS NOW! NYAC (800)338-5815 FOR SALE LEATHER LIVING ROOM SET. In original plastic, never used. Orig price $3000, Sacrifice $975. Can deliver. Call Bill (813)298-0221 CHERRY BEDROOM SET. Solid Wood, never used, brand new in factory boxes. Original cost $4500. Sell for $795. Can deliver. Call Tom (407)574-3067 GET BENEFITS NOW, GET PAID WEEKLY! The Motor Club of America Network Need Independent Home Agents NOW Sign Up @ www.theMCAnetwork.com AUTOS FOR SALE *** Everybody Rides ***DOWN PAYMENTS AS LOW AS $495 CALL: 904-354-0405UNITED USED CARS, INC.1222 North Main St. (Plus tax, tag & fees) > 1999IsuzuRodeo (Black)$2,950-CASH > 1998ToyotaCamry$1,995-CASH > 1987ChevyPick-Up 350 CID Engine $1,200>>>Cash Special <<< 1999 Chevy Monte Carlo $1,850 We finance everybody SAVE $100.00 with this AD EDUCATION ADMINISTRATIVE ASSISTANT TRAINEES NEEDED! Online Training with SC Train gets you job ready ASAP! NO EXPERIENCE NEEDED! Job placement assistance when program completed. HS Diploma/GED & PC/Internet needed. (888)212-5888 AUCTIONS AUCTION Real Estate & Personal Property Cliffside Mansion & Cottages, 216+/Acre Country Estates, Offered in 17 Tracts in Carroll County and Galax, VA. Long frontage on New River Trail and Chestnut Creek. Guaranteed to Sell Over $699,000. November 8, 10 am Personal Property; November 9, 10 am Personal Property, Real Estate sells at NOON. Sale held On-Site-Tract 7, 506 Cliffview Road, Galax, VA 24333. 5% Buyers Premium on Real Estate, 10% Buyer's Premium on Personal Property. For more information, go to woltz.com or call Woltz & Associates, Inc, Brokers & Auctioneers, (VA# 321) Roanoke, VA, (800)551-3588. PAGE B-6 THE STAR OCTOBER 27, 2012 Why the world wants Obama to winBy The Weeks Editorial Staff | The WeekWed, Oct 24, 2012 People surveyed in 21 countries over whelmingly favor President Obama over Mitt Romney. Whats behind that landslide? President Obama and Mitt Romney are locked in an incredibly tight race at home, but overseas, the vote isnt even close. A BBC World Service opinion poll found that residents of 21 foreign countries overwhelmingly support Obama, with an average of 50 percent hoping that he wins a second term and only 9 percent favoring Romney. France is Obamas biggest booster 72 percent of respondents support him. The only country where Romney enjoyed greater support than Obama? Pakistan. So why are foreigners in the bag for Obama? Here, three theories: 1. Obamas foreign policy works Overseas, the president has an undeniably strong record, says Jeffrey Simpson at Canadas Globe and Mail Obama has shown hes capable of mixing muscularity with restraint, extricating the U.S. from wars in Iraq and Afghanistan, avoiding direct intervention in Syria, and resisting the push to recklessly attack Iran all while relentlessly going after terrorists and playing a limited but key role in forcing regime change in Libya. Meanwhile, the world sees Romney displaying the hubris of the powerful and the ignorance of the uninformed, thumping his chest and scaring folks overseas. Forget foreign policy. This election is about the economy. 2. The world is associating Romney with Bush In many ways, this isnt really a reflection on Romney, says Max Fisher at The Washington Post In Pakistan, for example, people arent embracing Romney so much as protesting Obamas drone program in areas near the Afghan border. And more broadly, Romneys overseas poll numbers are consistent with [Sen. John] McCains in 2008, suggesting the possibility that many foreign publics associate Republicans with George W. Bush, whose administration was deeply unpopular abroad. 3. Soaking the rich is popular overseas The fact that France is more pro-Obama than anyone else says it all, says Matthew Balan at News Busters France is a leftist nanny state, and socialist President Francois Hollandeis trying to slap a 75 percent marginal income tax on people earning more than 1 million euros a year, a move the Heritage Foundations Nile Gardiner called economic suicide. Such proposals line up nicely with the presidents platform. No wonder he polls so well there.